Tone 8 is the Holy Day representing a new zenith of Solar illumination. Under the Day Sign of Road/EB the Divine Justice brought to Light is the Truth of Human Transformation that guides us toward a Divine Destiny. Our Power is revealed to us through proof that can be seen by Human eyes. The Faith we held in our ability to Know is being raised to Belief. The CHICCHAN trecena is waking us up to the Consciousness of our own Power. CHICCHAN held an invisible key to open the door to Spirit. We gave the Intention Life through the Passion and Intention to Know it. We invested our Breath, Matter and Movement as “Human Seeking to Know.” This is the Passion that wakes up our Gifts to Know the Truth. We can see the Truth of our own Transformation carried out by Knowing. Knowing changes the way we think and transforms our perspective on how we experience our Life, our past, present, and future. Our Reality, how we see things, is undergoing a Major Life Change. As Above, So Below. Holding the Faith that we were Given the Gifts to Know all things, Balanced in the world Below, we realize Truths of Knowing that even the Lower Consciousness of Human can believe in. The Serpent/CHICCHAN trecena presents 10 Portal Days in a row (Tones 2 thru 12). Portals magnify our experience by thinning the veil to the Dimension of Spirit. Portals magnify our perspective. On 8 Road/EB a Portal magnifies a new Truth about Human. We can see ourselves clearly as a work in progress. We can recognize that a process, a Flow, a Pattern of Movement of Transformation is expanding what we are Capable to Believe. The 10-day Portal is magnifying the CHICCHAN Force of Knowing that Human is a Creator that holds the Power to manifest Creation. Understanding our own Power changes our perspective on the Whole Experience of Living, as we clearly see a way we were given to Know the Meaning and Purpose of Life itself. 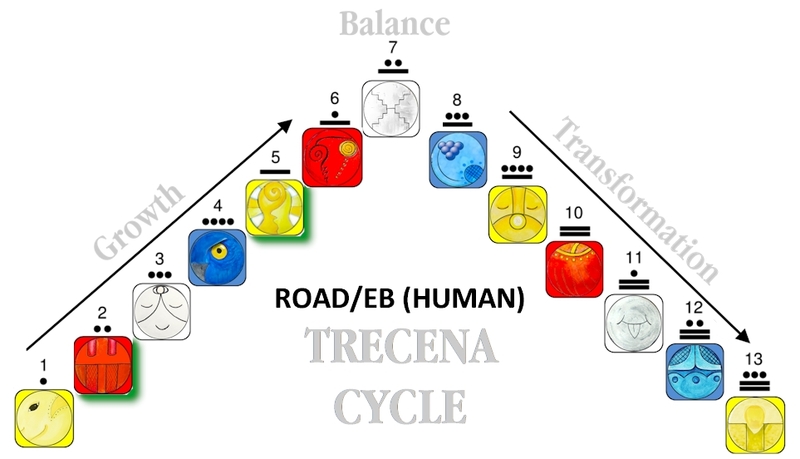 8 Road/EB is marked by the Maya as the Day of Human’s Destiny, the Saq’be’ – the Great White Way as Beings of Light. Our own Belief in the Truth of our Divine Destiny has arrived at a tipping-point of Human transformation. 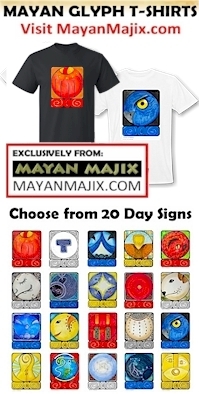 The Tzolk’in calendar marks the journey of our Human Transformation. The Maya celebrate this day to Honor the Gift of Knowing and Seeing through a calendar that was inspired to reflect the process and the purpose of the Time we are given. The K’iche call it the Saq’be’, the “Great White Way.” Today they Honor Human and the journey that is reflected by the Cholq’ij (Tzolk’in), the Calendar of Human Life, which tracks the time of our Transformation from Conception to our Time of Birth into a new world. It celebrates Human’s 9 months of gestation as the Human cycle of 260-days of transformation. We have been celebrating our Birthday on the Gregorian calendar by an outer experience. 365-days is the Earth’s Planetary cycle of transformation. We begin to see the synchronicity in our life and the whole picture of our place in the world when we choose to live by Saq’be Time. The calendar helps us line up with important dates, crossroads, and events in our Human experience. The many cultures that shared this same Tzolk’in count in our distant past accomplished the Knowing as their experiences were seen as interrelated with the Universe. They came to Know how their Belief changed things as the Intentions they held lined up with major planetary Dreams and Intentions. The Tzolk’in illuminates the Truth of a Transformation in Progress. This is a very special day of things lining up in correspondence and synchronicity. All signs between the Haab (Planetary) and Tzolk’in (Human) line up as a day that foretells a Major Awakening of the Power that is Growing through the process of Seeing and Believing. All the Signs that point to it are outlined in my July 15 forecast. The thoughts that have been raised to my own Consciousness have been about the Power of Believing and the Truth of Transformation. I’ve recognized how the Truth we stand on creates a reality. We can manifest any reality that we ourselves believe is True. The world will naturally go along with what we Believe, unless the the Truth held by others holds a greater passion and Higher purpose than our own. The Truth that will win out, is the Truth that the Divine Majority Believes, and the Truth of Higher Purpose and Meaning. Like the “100th Monkey” theory, the adoption of Truth by a single community of Monkeys (Human Creators), changed other Monkeys in places far away who adopted the new evolution. The theory supports the Truth that there is a threshold of common Belief that flips the balance of Truth for the Whole of the Species. We could all probably think of an example of one who believes very strongly in their own Truth… one who holds to the Truth of having the “greatest memory (and intelligence) of all time.” If we’re not Conscious of our own Truth, we can be led to go along, even if it defies our own logic and reason. There IS Power in Positive Thinking, positively believing our own Truth, even when our Truth is “false truth” (fake news). All of Humanity has been given an example that would not go unnoticed. When we are Conscious to see the Lower Manifestation, we can imagine the Higher Manifestation of this same Power of Believing. As Below, So Above. I’ve experienced this same Truth in my own personal life. This trecena has raised my awareness of “false truth” that others believe of me. My Truth is very different from what my family of origin believes. As a result, they believe I’m misguided. They have expressed for a long time their concern for my own Salvation. They believe very strongly that they are Loving me through their prayers and encouragement toward this end. They believed it more than I believed in myself. So, even though I disagreed, I was forced to go along with their estimation of my life. Through the Key of Forgiveness, I was given the Consciousness to finally see the dynamic apart from the blame. Blaming them, only empowered their Truth, because it was a declaration of my own Misery. Suddenly, what I believe about myself is stronger than what they believe about me. I’ve been discovering the Power and Freedom of my Higher Truth. I don’t need Saving. I’m soaring in Spirit. I can’t blame them for what they believe. After all, I was confused about it myself for a long while. Going along with their Truth, raised fewer conflicts in maintaining the relationships. All I had to do was never speak my own Truth. Now I don’t have to. I’m free to just be. I can stand on my Truth without defending myself. It would be nice if the Creator changed their mind, but if they never change, it will have no influence over my Truth. The Truth of Transformation to a Higher Power born through Consciousness has also met a new milestone. First, I would never have seen the “belief dynamic” if I hadn’t become conscious of my own thoughts and beliefs. Coming to Believe in my own Higher Truth, dispelled the darkness of “false truth” that anyone else could project onto me. The Saq’be’ the Great White Way, the journey of Human Consciousness, opens me to the Belief that many more things will be revealed through the process of the Journey. The Higher we climb, the more beautiful the view. TV once occupied all of my spare time. It was the first thing in the morning and last at night. I live by myself. I once related TV to having company, noise of other people in the background. I think we can all agree it’s a bad influence, but it was how I escaped my own fear of powerlessness, my way of tuning out my fearful thoughts. As much as I knew it added only more misery, I couldn’t turn it off. The Creator turned it off for me. When I invested myself in a Divine Intention that I was passionate about, it fell away. Just by virtue of investing hours of my time in a Higher Purpose, there is little to no time left for it. I learned something new from TV this morning. I’ve chosen to tune out of the news. I still watch it, but only long enough to see what’s going on in the world. I believe it’s an important reflection of planetary synchronicity. But, now if I have an hour or two to watch, I’m watching what few uplifting or entertaining programs there are that don’t paint a dark image. This is my way of not giving any power to Truth that may not reflect my own perception. So, this morning, I turned it on, and the most pleasant thing I found available was “Petticoat Junction” and “The Beverly Hillbillies.” I haven’t seen either in decades. It only took a one scene from “Petticoat Junction” to see the evidence of Human Transformation. I’m showing my age for those of you who may never have even heard of these shows that were very popular in the 1960’s. (If you want to see the extreme to which Human has been transformed, find an old episode and watch it for just a few minutes.) The jokes are not funny as they once were, and totally inappropriate to our current Consciousness. In the minute or two I watched, the plot unfolding was a story of a man, sizing up the woman he would win for his wife, walking the full 360 around her to size up the prize. Those were the days when woman was still best managed by keeping us “barefoot and pregnant.” That idea is total abhorrent to me now. I remember how the idea was almost strangely appealing in my youth, for no logical reason. Hmmm. It was a “false truth” with a lot of Power of Belief behind it. Today I see the more powerful Truths I’ve created. Even Truths that might be considered “beyond reason” hold the greater power for me because I believe them. I believe the birds are conscious of my thoughts and I am conscious of theirs. I believe the plants are thinking “thank you” when I bring them water. The Garden I created to Grow the Strength and Beauty of Spirit has come to life. Now when I look out my window, I see a reflection of Love that is directly expressed by the Whole of Mother Earth. I’ve even conceived the thoughts going on inside the eggs that the little Finch mother is attending. There I was on July 4th, playing them Brahm’s Lullaby from my ipad to help carry them through the fear of the firework explosions. (If my family could only see me now. LOLOLOL) My life is so much more interesting than it used to be. There is so much more to Love and be happy about. Today we can Know our own choice to create the world we’ll live in. The Power is in Believing our own Truth over all the “other” truth pressed upon us when we just passively go along. Taking action on our Truth by Intention brings our own Truth to Life. Today is a milestone for us to see that our own Truth is the most important Truth we can ever know. Our Truth is the Spark that Lights the Fuse of the Power to Create it. Our Consciousness of a Higher Intention of Truth, is greater than the power of the darkness of unconsciousness. One of the MANY great gifts of getting older is the witness of many transformations. I’ve seen faces on tabloid covers and other stories of the world that I thought would never end. I’ve seen MANY stories and faces disappear, like Marilyn Monroe, Mickey Mantle, and “Petticoat Junction.” I once thought Brittney Spears would be on the cover of every magazine until the end of time. I’ve seen MANY faces come and go, and many ways of believing come and go. You might be old enough to see how even the way we order a cup of coffee has come and gone. The advantage of our accelerating transformation is that now we can see it happen in a shorter amount of time. My passion for the journal is to share that “in lak’ech” you can know it faster than I did. It won’t take decades. We are now all seeing changes within days and hours. We’re moving toward the Divine Power to Know transformation as it happens. This acceleration is making it possible for us to all see it at the same time. All at once, like the 100 Monkeys, we could ALL Know our Power to create. With the Truth we inherited from all the Humans who made the journey through life, the Wisdom that was preserved for us, each generation has accumulated its own Wisdom to add to this store of Knowledge. The Higher Truths that we add Power to through our Conscious Intentions, has undergone a Transformation of Spiritual Growth and Inner Strength of Knowing. Today, we can see how our Higher Truth has become powerful to dispel the lower truth that was created from the darkness of unconsciousness. Through a Choice to Know the Divinity, Authority, Power and Unconditional Love of the Creator, we reached out to the Highest Truth of all. Yesterday, on Tone 7, this Truth was manifested Below so that today, on the Holy Day, we would be Changed by Knowing it. The Cherokee Day Sign, the Rattlesnake Tooth, is a sign of Spiritual medicine used for the purpose to Heal the Spirit. The Rattlesnake Tooth was used to break the skin in a ritual of Spiritual Healing and left a Holy Mark on us, so we will never forget – we CAN NEVER FORGET the new Higher Truth we Know. This is the Day the Maya celebrate this Truth and honor the Gifts to Know it shared by a Sacred Calendar of Human Transformation, a White Way that empowers us as a Divine Creator. May we find our own special way to observe this day as a Sacred Moment the Creator Divinely Designed for Human from the Beginning of Creation. To all my relations, may our eyes be opened to all the Truth of our Transformation that is manifest in the world. May we use our Monkey gift of All the Time we’ve experienced to see the Truth of our own Transformation. May we clearly see how the ways of thinking, the perspectives that have changed, have molded into being the new world we are experiencing. We don’t have to change the world in an instant to see it. Just like every other transformation, it happens in incremental steps. We don’t have to “know it all” to know we’re moving in a clear direction toward the Consciousness of Knowing. We don’t have to wield the Power to believe in the Possibility enough to imagine its Truth. May we give thanks and Acknowledge the Divine Agency that would make sure we could see it by intervening with a Divine Inspiration of Higher Truth. May we claim it as the supernatural gift of seeing something that was Unseen to us, that became visible through an experience of Divine Consciousness. May we see a new vision of our Self. May we see our own Human body was created as the vessel for a Divine Being held inside, with eyes to see what Human eyes can not see. May we celebrate the Truth that we were designed in the same image of the Creator. May we Honor the Divine Trinity of Consciousness, Human Being, Divine Being, and the Almighty Being, as the Holy, Holy, Holy. P.S. It’s curious that the “world” would tell us every day how much there is to fear and how little we can do about it. There is synchronicity even in this number 19. 19 is said to represent the “signature of God” the “mark” of Divinity, the 1 and 9 are all the numbers reflected by the Alpha and the Omega that creates a Zero, a circle that Knows everything within it by the numbers. I’m grateful that Higher Truth is Eternal, that once we Know it, it can never be unseen again. We manifest a Major Life Change when we Know our own Truth. We will never see ourselves as Powerless in the same way we saw ourselves before. I’m grateful our lives can be Wholly Transformed by the Truth of Higher Consciousness. REMEMBERING THE POWER OF THE SERPENT/CHICCHAN, THE CHEROKEE CALLED THE POWER OF DO’TSI: Serpent’s symbol is Constellation Serpens. Serpent people are Sky people who come to earth periodically as Educators. As above-So below, on Earth the Serpent is the roots of the tree of knowledge. Serpent power is vital energy, the moving force, the instinct and desire for creativity, the trigger that sets off the action. It lights the fuse that magnifies and explodes the life force itself. Knowledge, combining science, technology and psychology, plus spirituality are seeded on the planet. My Spirit has been filled with incoming Love from those who have shared the gift of their donation. It was a Miracle to ask, and each donation has been a Miracle to Receive. Every one who reads my journal brings me a gift each day in Spirit. Just by being present and caring and hoping for me, you are moving the matter in the Universe in the direction of my Intention. No donation is ever a condition to be part of my dream. I have something more to ask of you. Because this Dream feels “bigger than me,” I am realizing some fears that have surrounded the dream. Some were obvious as fears it could never happen. What surprised me is my fear of going. A powerful gift you can make to the cause is to hold the vision that the journey is a safe one and claim it as a perfect one by Divine Intention. I need that so much. Our U.S. immigration issues, and now travel advisories, raise consciousness to the reality of the new dangers in these places. May we uphold by prayer all the Spirits that live there, the new generations that carry on the Mayan tradition to Uphold the Pillars of Divine Spirit, Peace and Love for this Holy Place. I pay forward my thanks for every positive thought I know you will help me hold. I discovered on the Tzolk’in that both the scheduled departure and return dates are Portal days. Reading up on the Jaguar, I found noted that it’s gift of stealth as a shape-shifter gives Jaguar the power to confront its fears. This journey is already underway with a life of its own. I THANK YOU ALL SO MUCH FOR BEING HERE. THE CONNECTION BETWEEN YOU AND ME IN AN INTENTION TO CONNECT WITH THE CREATOR IS NOTHING SHORT OF A DIVINE MIRACLE IN MY LIFE. ~ Debra, with all my Love.